Introduction to Environmental Impact Assessment provides students and practitioners with a clearly structured overview of the subject, as well as critical analysis and support for further studies. 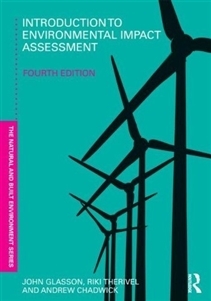 Written by three authors with extensive research, training and practical experience in EIA, the book covers the latest EIA legislation, guidance and good practice. Although the book’s focus is on the UK and the EU, the principles and techniques it describes are applicable internationally. With colour images and a new modern design, the book provides an essential introduction to EIA for undergraduate and postgraduate students on planning courses, as well as those studying environmental management and policy, environmental sciences, geography and the built environment. Planners, developers, community groups and decision-makers in government and business will also welcome the book as an effective way to get to grips with this important and evolving subject that affects a wide range of development projects.